The People’s Democratic Party (PDP) has elected former Minister of Works, Chief Tony Anenih, to chair its Board of Trustees (BoT), a position which he occupied until 2007. Chief Anenih, 73, was elected after a meeting of the board, which began at about 8.45pm, Monday night and ended at about 12.45am Tuesday morning. His emergence was by consensus following a long drawn meeting of all the members of the board presided by President Goodluck Jonathan in the presidential villa. 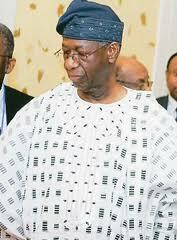 Briefing the state house correspondents after his election, Chief Anenih said that he had been chairman of the BoT for two years before and has all it takes to move the party to greater heights. He added that he is not in doubt of his ability to make meaningful contribution to the growth of the party. According to the PDP the BoT had approved Professor Jerry Gana’s report on stream lining of the membership of the board as well as carry out necessary amendments based on the provisions of the BoT laws. The amendments were in the areas of tenure of office for BoT members, and selection by consensus of the new chairman. The election to head the party’s BoT is coming few months after President Jonathan appointed the former Minister of Works as the Chairman of the Nigerian Ports Authority. I wonder wat an octogenarian wil still be doing in politics. He was there once and now he is back to steal. He was once a minister of works yet could not construct benin road. He stole billions of naira yet nothin was done.